Bad Bob. This year in general I’ve done an above-average job of keeping the flourishing winter weeds under control. But somehow I did an under-average job in the blackberry patch, which is to the south of our house and out of sight, out of mind, so to speak, because our routine activities don’t take us to that side of the house. 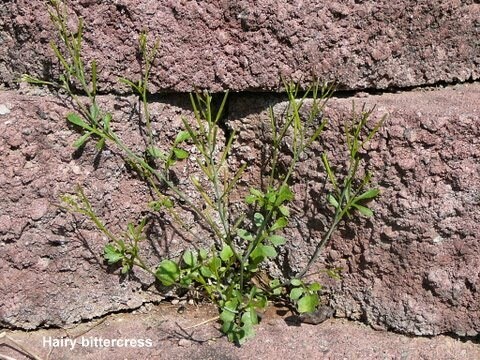 Hairy bittercress is doubly subversive because it tempts gardeners to ignore it. Its leaves pretty much hug the ground—easy to overlook. The flowering stems are quite fine—not as eye-catching as a stand of chickweed. 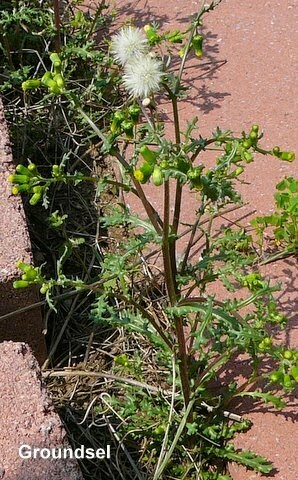 But one feature of hairy bittercress is attention-getting—its seed capsules. As they mature, they coil in such a way that they “explode” and propel seeds up to nine feet when disturbed by a gardener, an animal, the wind, or a wandering garden gnome. So there was my fine crop of hairy bittercress. When I looked closer and noted that the seed capsules still had a hint of green, I hoped they weren’t quite ready to scatter at the slightest touch. I reached down, grabbed the biggest plant, and pulled. A shower of seeds bounced off my pants legs and rained down on nearby soil. For an instant, I thought of summer rain falling on my great-grandmother’s tin roof. Back to the reality of unwanted weed seeds, I shook my head in despair and redoubled my effort at “gentler” removal. Luckily, most seed capsules were not ready to explode—so I kept on pulling. I’ll have to be vigilant all summer to make sure I uproot the crop of bittercress seedlings that inevitably will emerge. A reference work—“Weeds of the Northeast” by Uva, Neal, and DiTomaso—indicates, the plants may produce “several generations” over one growing season. Vigilance—weekly vigilance—is the price of freedom from hairy bittercress. Sigh, sigh. Weed, weed. Pull up hairy bittercress—and, oh yes, uproot my two other blackberry patch nemeses—common groundsel (Senecio vulgaris), another winter weed whose yellow flowers already had gone to seed and which floated away on fluffy parachutes as I pulled them, and mugwort (Artemisia vulgaris). 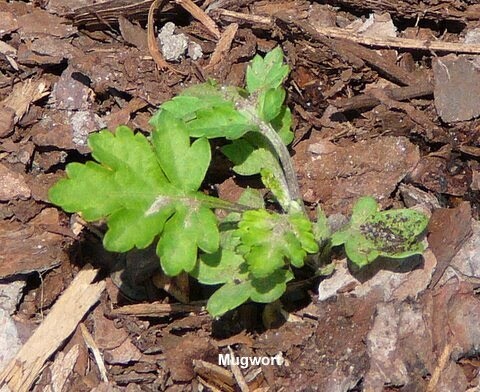 Mugwort, sometimes called chrysanthemum weed because of the shape of its leaves, is difficult to eliminate because it reproduces mostly by rhizomes, or underground stems. Whenever I try to remove it, root sections that break off seem to establish a new plant within a few days. In an hour the job was done. The bittercress, groundsel, and mugwort were gone—for now. But I’ve learned a lesson that I’ve apparently failed to learn in scores of previous springs: don’t let winter weeds go to seed in your veggie garden. Perhaps the three blizzards and the record snowfall in Maryland during winter 2009-2010 made me a bit complacent about winter weeds this year, but they were under the snowdrifts, insulated from the frigid Canadian air, waiting for the warming sun of February and March to stimulate their growth. Next year I really will keep winter weeds under control. In fact, if I could only find a pencil I’d jot down my first New Year’s Resolutions for 2011.